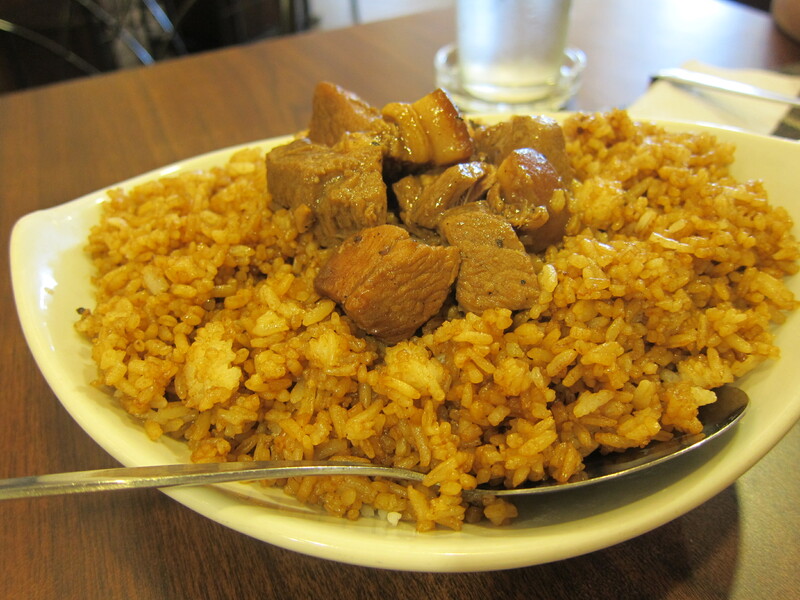 When you think of Filipino food, which dishes come to mind? 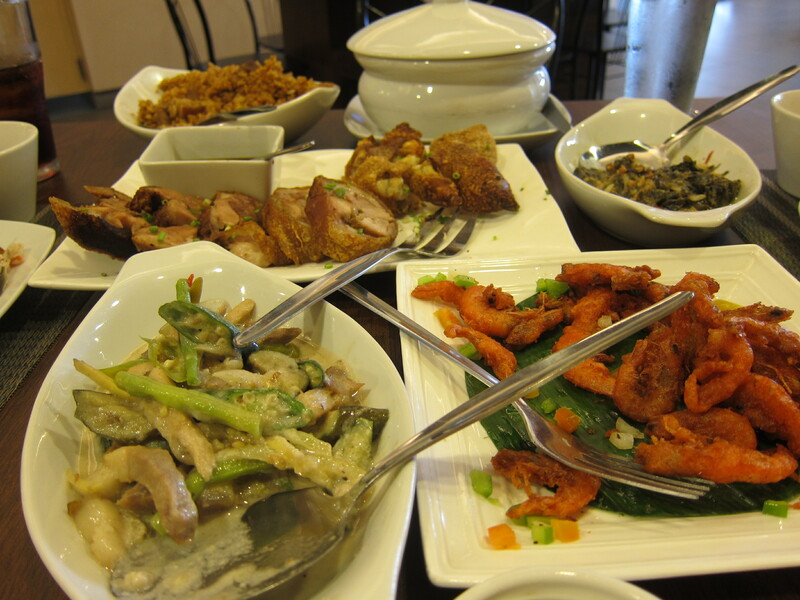 Filipino dishes are a unique mixture of Eastern and Western cuisines. It is a fascinating blend of Spanish, Malay and Chinese cultures reflecting the nearly 400 years of influences we have as a result of the colonization or occupation of these countries. Food is definitely an integral part of the Philippine’s local art and culture. It is a reflection of various Filipino traits which we take pride of – bayanihan (camaraderie), being warm and hospitable, and being family-centered, among others. Filipino foods are unpretentious. It is best enjoyed in the company of friends and relatives. It is a celebration of simplicity and life togetherness. 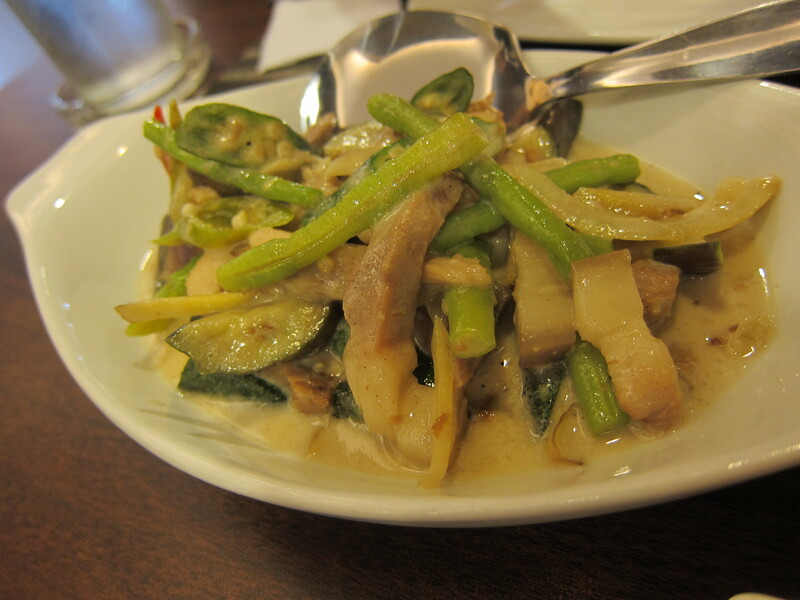 Last Sunday, we decided to visit a Filipino restaurant located in Fairview – Toni’s Grill and Restaurant. Amongst my favorite Filipino dishes are Crispy Pata (Crispy Pork Leg), Laing (Taro Leaves in Coconut milk), Kare Kare (Beef in Peanut Sauce), Adobo, and Sinigang (Tamarind soup), among others. Since there was only three of us (me, my hubby and my mother-in-law), there was only so much we could order from this restaurant. For starters, we ordered the Nilasing na Hipon(Price: PHP160.00). This is a typical Filipino dish where the shrimp is deep-fried and accompanied by a sauce. In this case, the sauce is white vinegar with chili, onions and garlic. This is also a perfect pulutan. I love the presentation of this dish. 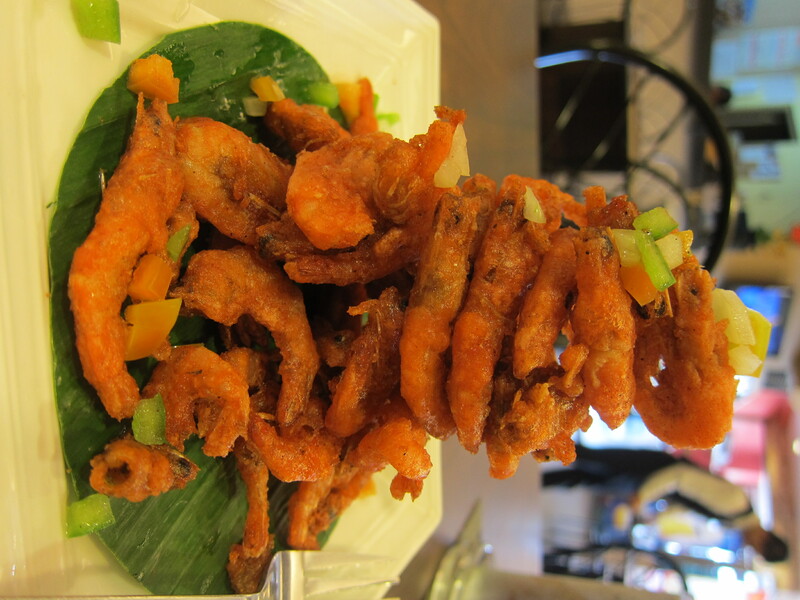 Perfectly deep fried, the whole shrimp can be eaten (head, body and tail!). Rice is a staple in Filipino food. Mixed with one of my favorite home cooked dishes, this is a definite must order at this restaurant – Adobo Rice (Price: PHP100.00). This has the right amount of saltiness and blandness that is perfect for the other more saucy dishes we ordered. 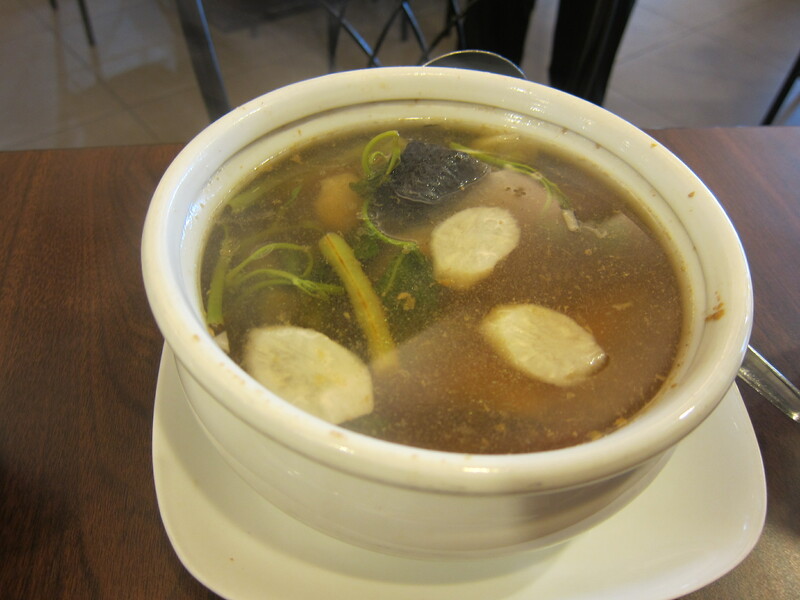 For soup, we ordered Sinigang na Tiyan na Bangus. For mains, we ordered Bicol Express, Laing, and Boneless Crispy Pata. 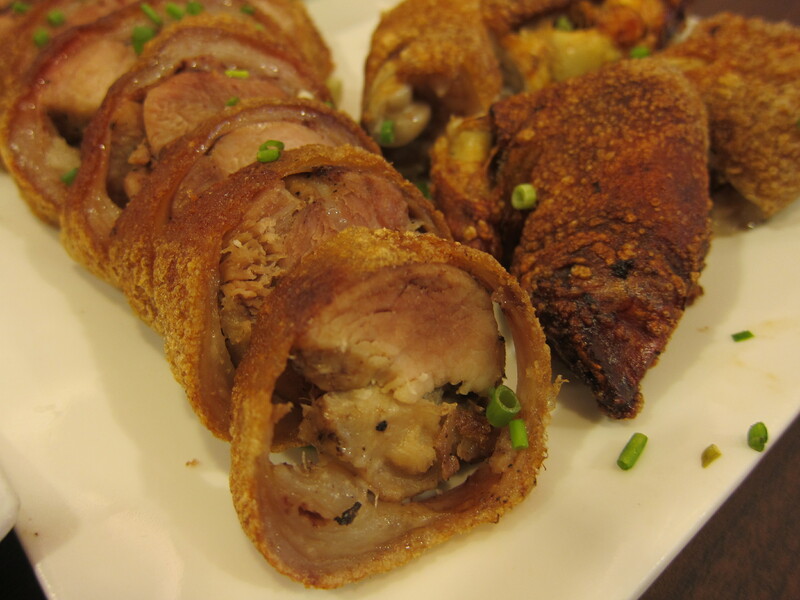 This Boneless Crispy Pata (PHP450.00) is one of the best sellers of the restaurant. The meat is tasty and soft. This would have been perfect if the skin is really crispy. Again, this is paired with a simple sauce. I think the sauce is a mixture of soy sauce, black vinegar, fish sauce, and shallots. Better eaten and taken off from the bones with your hands. The Bicol express (PHP150.00), also known as Sinilihanin Bicol, is a popular Filipino dish traditionally made from chilies, coconut milk, shrimp paste or stockfish, onion, pork and garlic. My mom-in-law loved this dish. It had the right combination of spiciness and sweetness. (Note: We specifically told the waiter to not make it too spicy! 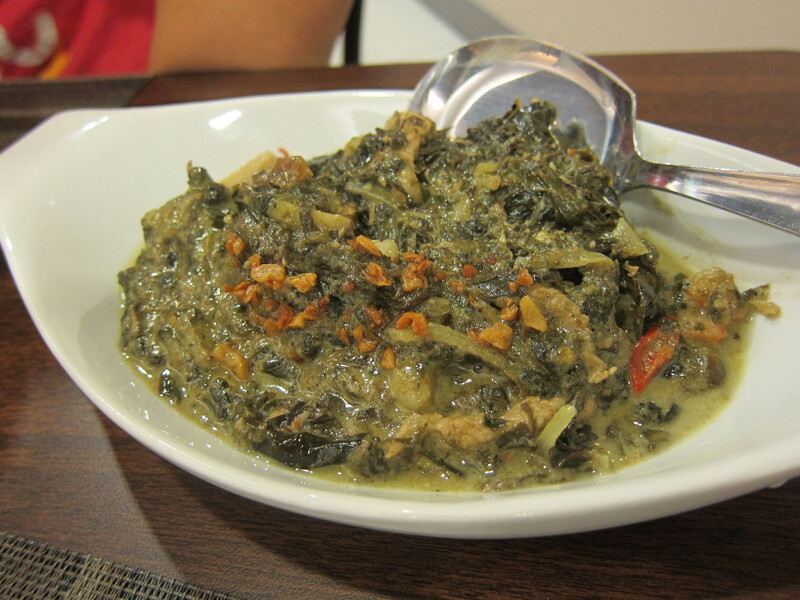 Another favorite dish we had that day was the Laing(Price: PHP120.00). For desserts, we had to try their Malagkit na Mangga (Mango in sticky rice). The combination of sumanand mangoes is a great ending to the food we consumed. Toni’s Grill is a definite must-try if you are in this side of town. They offer a very affordable variation of Filipino food that is great to be enjoyed in the company of friends and families. hi may wifi dito? thanks!